What’s Happening on GulchRadio FM100.5? Ric does a local, live show, featuring a variety of rock/soul/county classic tunes and new tunes to make the mornings move along, some comedy, satire, and weather tossed into the mix. 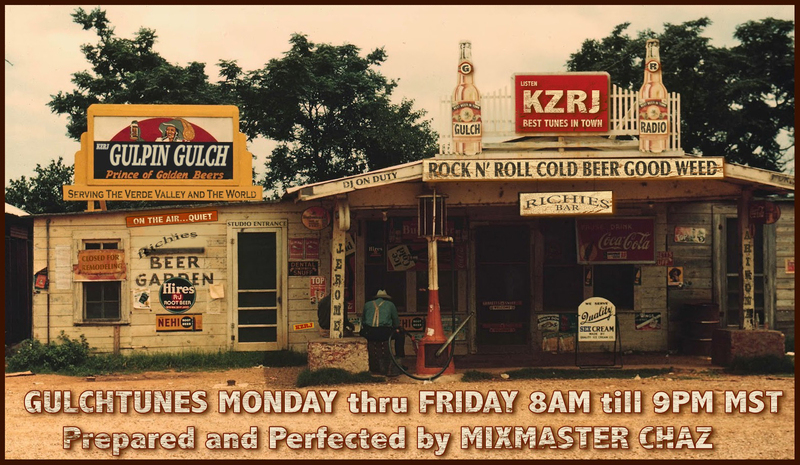 Alternative -Rock – Reggae – Blues – Country – Folk – and best of all, fodder free, we use only the tastiest ingredients mixed together with love and care by Gulch Radio’s beloved “mixmaster” Chazman – the behind the scenes lightning rod that keeps it all happening here at Gulch Radio! 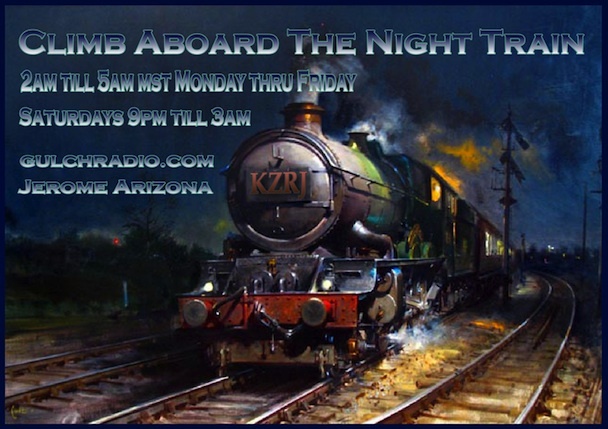 2:00 AM- 5:00 AM MST Monday thru Friday/Saturday9 PM to 3 AM MST – The Night TrainClimb on board for a ride through a world of rich and mellow rock with an emphasis on soul and romance and a train track or two – music to keep your late night/early morning groove on the right track. “The Hermit” hosts Stuck in the Psychedelic Era twice weekly two hour radio show on gulchradio.com FM100.5 KZRJ Jerome, AZ featuring music from roughly the years 1964-69. The show is literally a throwback to the days of “underground” radio. There are no pre-recorded jingles or promotional spots; just two hours of music, punctuated by occasional commentary by The Hermit, whose own radio career began on a small closed-circuit station in the early 70s. The Hermit takes lot’s of his music directly from vintage vinyl, scratches and all. The rest comes from Compact Disc compilations and re-issues of original albums, all taken from the Hermit’s personal collection. 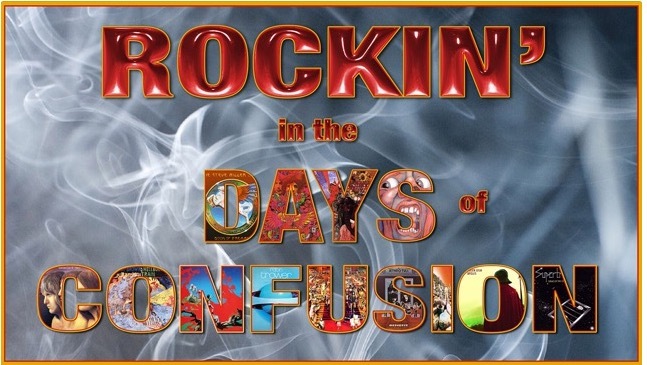 Rockin’ in the Days of Confusion is a weekly 60-minute show that revisits the golden age of progressive rock radio (roughly the years 1968-76). Emphasis is on longer album tracks covering a variety of rock sub-genres, including hard rock, folk-rock, heavy metal, jazz-rock fusion, art-rock and more experimental tracks that defy easy classification. As is the case with our sister show, Stuck in the Psychedelic Era, Rockin’ in the Days of Confusion has no pre-recorded jingles or liners. Commentary is centered on the music itself, with additional track information available at thehermitrambles.blogspot.com (or by hitting the blog button at hermitradio.com). 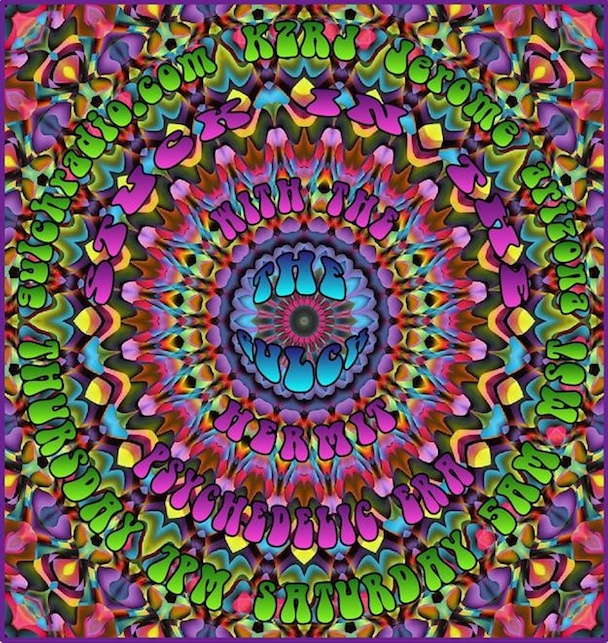 Saturday 5 AM to 8 PM MST – Three hours of Stuck In the Psychedelic Era and Rockin’ In the Days of Confusion – The Hermit takes over the early morning with his great shows, if you missed the most recent episode on Thursday night, catch up on Saturday morning, plus you get an added encore hour to enjoy this great show. 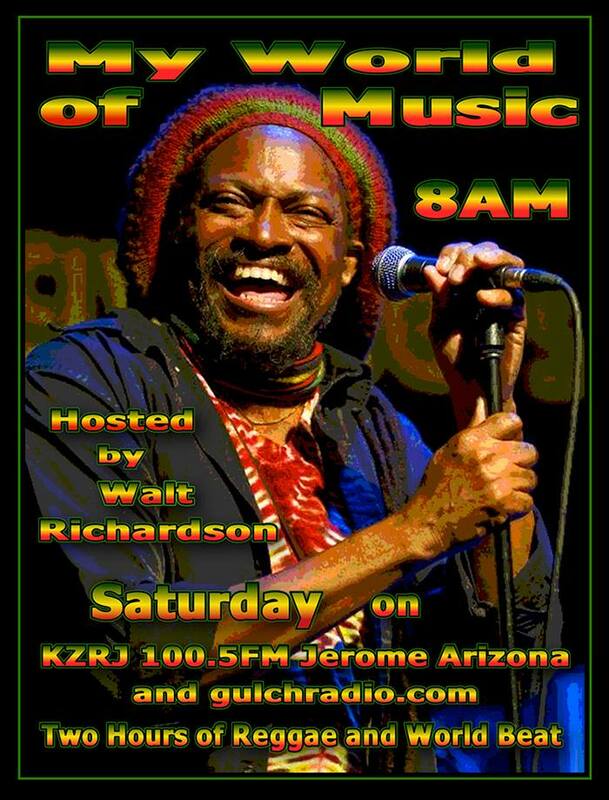 Saturday 8 AM to 10 AM – My World of Music hosted by Arizona’s Walt Richardson. Gulch Radio is pleased to present My World of Music, hosted by Singer-Songwriter Walt Richardson II. The show is produced at the studios of AAPRC Affiliate, Radio Phoenix, in Phoenix Arizona, where it has enjoyed popularity on the air since 2007. There are lots of musical surprises… pieces you haven’t heard before… but find intriguing. A hot Mambo band, a South African chorus, Arab groove, Bob Marley performing live, a steamy Samba, a Reggae version of Bob Dylan’s classic “Maggie’s Farm”… Much of the music in this program is highly rhythmic, danceable mix.This is the kind of variety listeners can expect to hear on My World of Music. Host Walt Richardson is essentially a Reggae man; A working artist, performing singer-songwriter, with a passion for rhythm and acoustic guitar. Known throughout his home state of Arizona, this celebrated son was honored with an induction into the Arizona Hall of Fame for 2014. During his 30 plus years as a both a solo artist and bandleader, Walt has toured throughout the United States and Mexico, and shared the stage with Reggae greats like Third World and Ziggy Marley. He’s current working on his fifth recording. 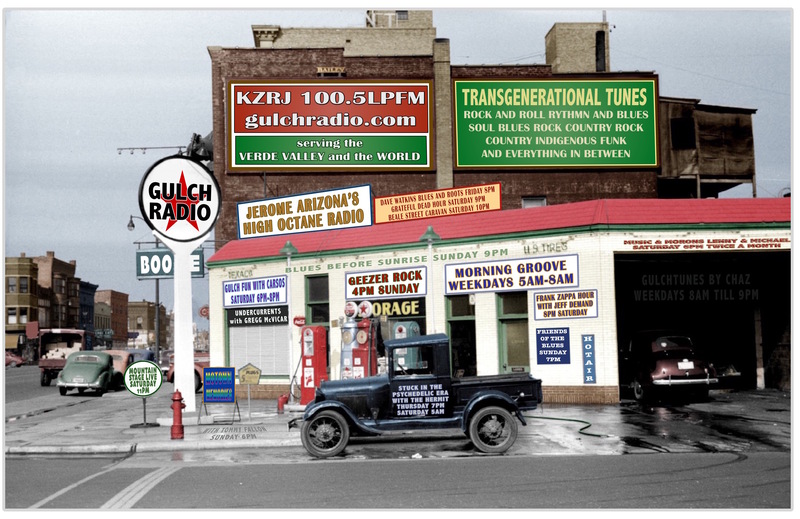 Saturday 10 AM to 6 PM MST – GulchRadio’s weekday morning man, Ric picks the Saturday platters to keep you movin’ from early morning to late afternoon, then shifts the mood to a more evening offering of rock, blues, soul and more right up to Jeff Demand’s Frank Zappa Hour, exclusive to Gulch Radio at 8 PM MST. 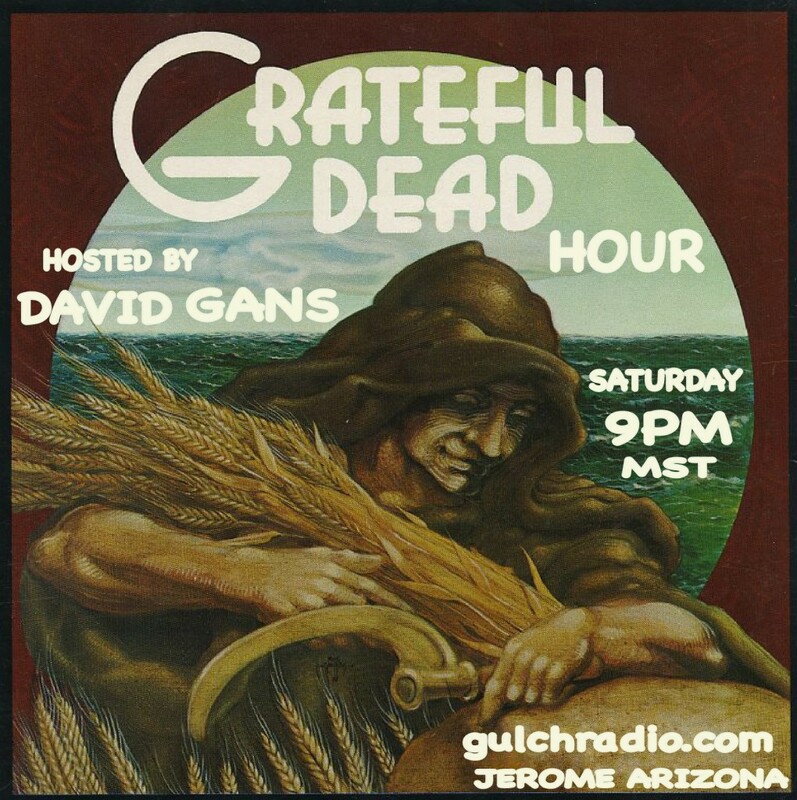 Saturday from 9 PM to 10 PM MST – David Gans and the Grateful Dead Hour. 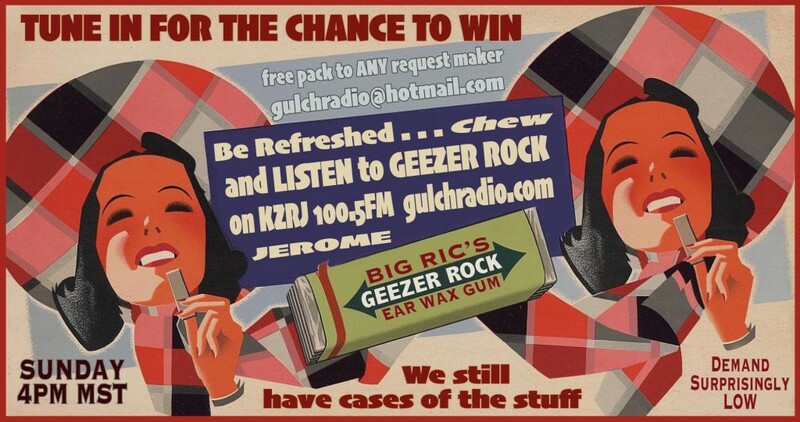 One hour of the Dead – music and interviews every Saturday night on gulchradio.com FM100.5 home sweet Jerome. 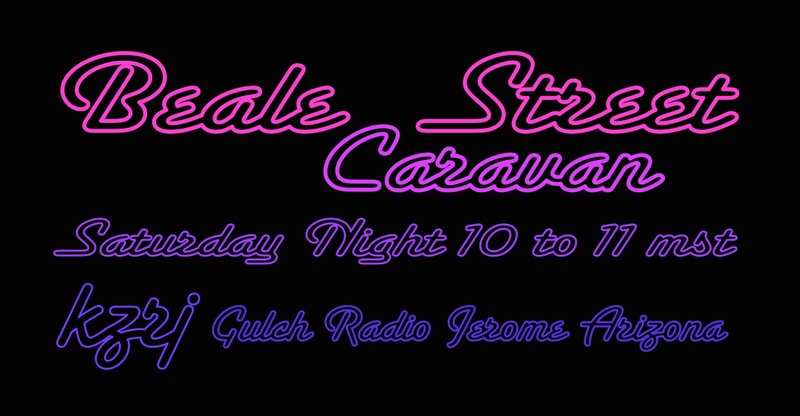 Saturday Night 10 – 11 PM MST Join GulchRadio and Pat Mitchell Worley for Beale St. Caravan – a great blues show with live performances from the blues greats. A quality NPR production, styled in a magazine format, Beale Street Caravan takes listeners to exciting live Blues events each week. The program is hosted by Pat Mitchell Worley, with Feature Host segments from industry insiders such as Jerry Wexler, Bob Porter, or Cybill Shepherd. Blues lovers, this is an excellent program, EVERY Saturday night at 10 MST on GulchRadio! 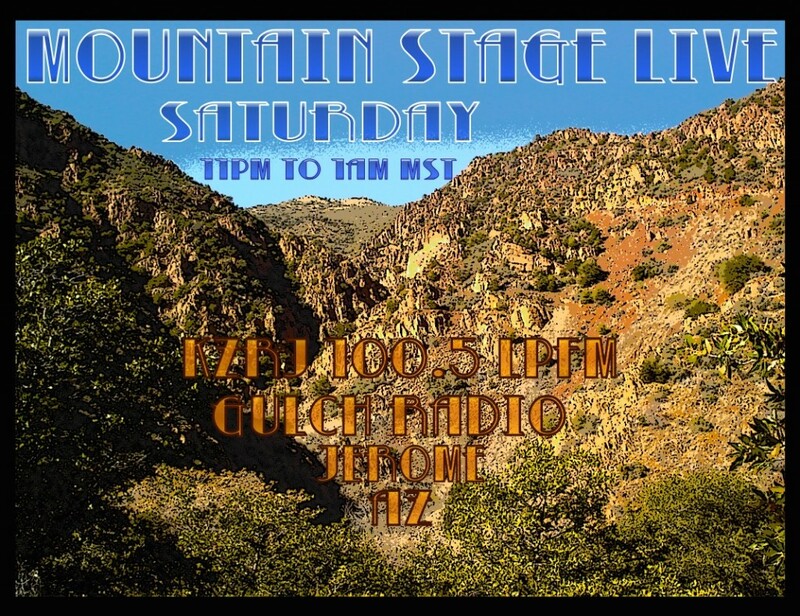 Saturday Night 11 PM to 1 AM MST Mountain Stage Mountain Stage guarantees listeners the best seats in the house for new performers and established artists. It’s a two-hour weekly exploration of the exciting and spontaneous sound of live performance, offering intelligent, contemporary music seasoned with traditional and roots artists. Hosted by Larry Groce, the program occasionally takes a road trip to bring music lovers rare and special events as they happen. For example, listeners enjoyed front row seats at a Nashville hot spot, joining enthusiastic fans in a salute to the Fairfield Four, legends in acappella gospel. With Mountain Stage, listeners are treated to the performers and the place. This award-winning show is the longest-running program of its kind — over 1,200 artists have appeared on the Stage since it premiered nationally in 1985. 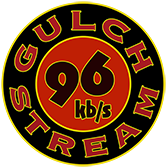 GulchRadio is the place to be every Saturday night at 11 MST – around the world at gulchradio.com, at home in Jerome, and the Verde Valley – FM100.5 KZRJ-LP. Greg’s great show at a time when most of us can hear it. In true GulchRadio tradition Greg mixes familiar and unfamiliar cross genre music with both contemporary and traditional Native American music. 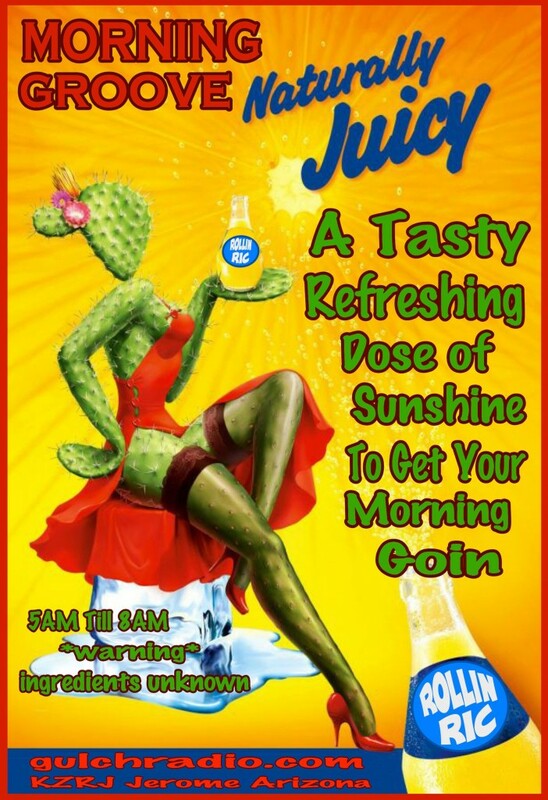 It’s a special show – Sunday mornings are special on the Gulch. Presented through the courtesy of the NativeVoice1 Network. 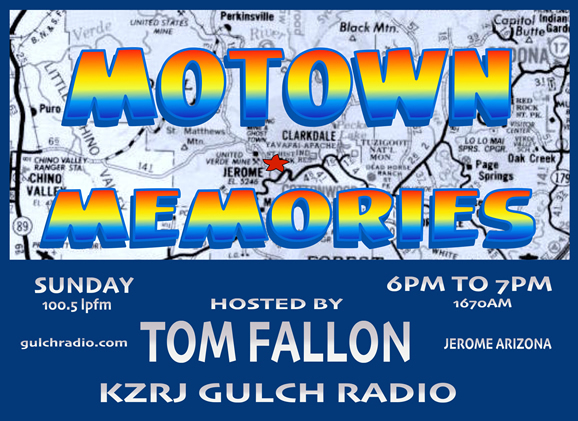 6 to 7 PM MST – Motown Memories Motown Memories.Motown fans love Motown Memories with Tom Fallon, Mr Motown spins the obscure and the hits with an always interesting show full of Motown Memories. If you are a Motown fan, and why wouldn’t you be? … then this is THE show for you. All the greats! Pure Motown! 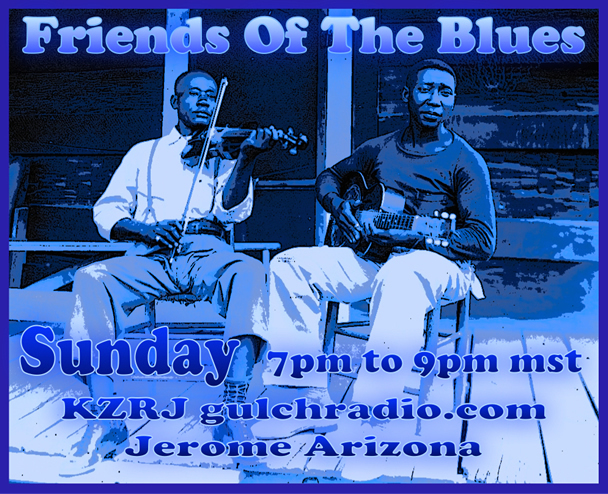 Sunday Nights – 7 to 9 PM MST – Friends of the Blueshosted by “Shuffle Shoes the Blues Guru” and Dr. Sky Dobro. Friends of the Blues features two solid hours of blues legends like Muddy Waters, Willie Dixon, and Sonny Boy Williamson; current “unknown” wailers like Kid Ramos and Too Slim and the Taildraggers; and regional stand-outs like “Mondo” Cortez’s Chicago Blues Angels, and the Kilborn Alley Blues Band. True aficionados the hosts are immersed in Blues culture; they know the artists, the labels, the recordings, the band members – and they do a good amount of traveling to live blues performances throughout the U.S.
Sunday night 9 PM until 2 AM MST Monday morning Blues Before SunriseHeritage Blues on GulchRadio – For 17 years DJ Steve Cushing has aired Blues Before Sunrise, the “Blues Heritage Showcase”, over Chicago’s public radio station 91.5FM WBEZ, and for the last six years the rest of the country has also had a chance to hear his show via satellite – Blues Before Sunrise has long served an audience that includes loyal home listeners, musicians lounging on break, lovers in their living rooms, cab drivers and other service workers pulling the graveyard, and even teen airwaves surfers discovering an entire musical world peopled by cats who were hip before them. 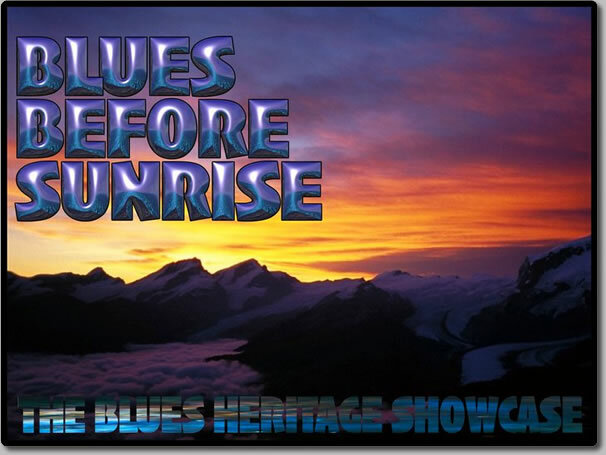 Blues Before Sunrise showcases blues as part of a cultural landscape that includes jump and jive, rhythm and blues, swing, doo wop, gospel, comedy, and recitation, and never is the music presented as kitsch or retro fashion in the way that some music has been exploited and trivialized. For Cushing the blues is a living African-American tradition with deep roots. As a musician himself bearing substantial credentials with Magic Slim and The Teardrops, the Lee Jackson band and Smokey Smothers and The Ice Cream Men, Steve Cushing numbers among his friends and closest associates the artists on this recording-fellow musicians to whom this is a vital, thriving music as well as a means of making a living. This is a great show that GulchRadio is proud to present – join us. If It’s Good We Will Play It For You! Just heard about and found you guys. Finally, a station out here, where I don’t feel like throwing my radio out the window. Spare that radio! Thanks for writing, we hope you continue to enjoy Gulch Radio. Lovin the RicNRoll show every morning… start work at 7am EST (Mississauga Ontario) and catch the show till 10am – this music is just a fantastic way to the start the day! Ric sez – thanks very much for writing – glad you enjoy the show! First started listening in Michigan. Now that we’re just down the road in Sedona, we’re enjoying the “hometown” station even more. Radio doesn’t get much better than this! Congratulations! Welcome to Arizona! Thanks very much for the note and thanks for dialing in the Gulch! Hi Kip – that would be the Barnyard Blues by Phantom Blues Band – thanks tuning us in and turning the neighbors on. Kip’s neighbor …………… so glad to have some decent music here the verde valley. Thanx, keep up the good work! One question, why does it say NOw PLayiNG as “UMelt” with Beatles VI album cover showing, and showed as Clapton playing last song, but these are incorrect….what’s up with that? Welcome to the Verde Valley Carla and thanks for writing. We’re happy you like the station – that now playing thing seems to have some issues, it runs behind quite often. Liaoning Province, China – I’ve been stuck here in China for 12 years now and you cannot imagine how happy I was to stumble across you. Finding streaming radio here is like searching for a unicorn. With censorship on the Chinese side, and copyright restrictions by companies (like I-heart-radio), it’s a rarity to find a station at all. Finding someone playing a format so suited to me… I feel like I just found a 12 lb. gold nugget in a stream. I’m seriously considering wiring up this old apartment for sound. Wow Kyle – thanks a million for your letter. We’re glad to bring music to your home! WOW!!! An awesome radio station…Finally. By far the best array of good music ever. Love hearing songs from my childhood I don’t remember hearing in 20 some years. Thank you for your diligence getting on the air. You played a song last Friday the 13th that had a chorus ending with the lyric “ghost town radio”. ? Often get swept away by the music you play. I listened to “Music for Morons” tonite..I had a fanatically frenzied freakin’ GOOD TIME with Me, Myself and I..and YOU TWO, of course! Thanks so much for those 2 hours! Can’t wait ’til next time! Maybe I shall join the “Moron Tabernacle Choir” during your time off. .just to keep me busy! Great show! Thanks Laurie – they’ll be back in two weeks. I’ve been trying to locate a song you play. The lyrics are “unleash the rain wash the blood of man from this wasteland”. Some more lyrics are “clouds come together and darken the sun”, “a mighty crack feel the vibration”. Please help. Your station is AMAZING! Thanks Rob – give us a hint as to when you heard it. I believe the last time I heard it was Thursday 3/19/15 around noon. I have heard it more than once in the last two weeks. I hope you can help me, I’ve had no luck looking up lyrics online. That’s “River” by Monte Montgomery. Can you help me identify the bluesy instrumental you played at noon on Thursday 4/9/15. Thank you so much, your station truly is the best! You guys can thank Sen. John McCain! He was talking up Jerome on Imus in the Morning today. Decided to Google Jerome and found you guys. Great radio. I’m stuck in the 60’s. Will be listening on line from South Carolina. Thanks for tuning us in Joe – Sen McCain is a frequent visitor to Jerome, having a home nearby. Not only can we thank him for your tuning in but advocating for and sponsoring the bill that created low power FM radio which enabled us to take to the FM airwaves in November. What were the nature of his comments about Jerome? He and Imus once made a trip to Sedona together and talked about that. He just commented, as a side note, that if you visit Arizona you really need to see Jerome. Commented on the it’s beauty on the side of a mountain and the really great people. I’ve been to Flagstaff once, next time I will make it a priority to visit you guys. That’s great – thanks for the update. Jerome is a fun place, when you visit here you can tune us in at 100.5 – we’re honored that the Senator thinks highly of our little town. I have been thinking a lot ’bout how it would b great to hear Music&Morons EVERY Saturday. .but I am a Proud Gemini. .and Proud music enthusiast..I love Carsos’show! He is a deep, thoughtful, tender man..an inspirational groove to the Gulch! I look forward to hearing his show evry other wkend! Hi Laurie – we’re glad you enjoy both the Morons and Carsos – both shows are live here in our studios in Jerome.Carsos has been doing his show now for many years and is indeed an inspirational guy, and also to mention that he’s the guy the keeps the station running when we’re on vacation. As a fellow Gemini and long-time music enthusiast, I want to thank you for your compliments. I hope you will continue to enjoy Saturday nights here on the Gulch for a long time to come. Thanks for writing. Thanks for the kindness! Most of my numerous radios are ALWAYS tuned to The Gulch! They shall remain the same,long after I’m gone! (It’s in my will!) Happy Birthday to You, Carsos! wet hair..apply shampoo..lather..rinse..repeat! missed my hygiene cuz 5/2/15 Music and Morons was so neat! Thanks! Love you guys! We’re glad you enjoy Steven Cushing Blues Before Sunrise – we do too. Thanks for the good words. Hey Mike – thanks for listening for all these years, 2005 is when we went online. Glad you enjoy Gulch Radio and thanks for the note. Great tunes, reminds me of WDST in Woodstock,NY. Glad I found you right here in the Verde Valley. We’re glad you found us too, Eliza – thanks for listening and thanks for the note. On August 12, 2015 at 4:30 you played a blues instrumental, followed by a reggae song and then a little later, a song singing about ‘going to California. Could you please tell me the artist and title of these three songs? Hi Rob – the songs you asked about are:Trouble Ain’t Far Behind – Gary Moore, Hypocrites – Bob Marley and California – John Mayall. Right On! Get Real!…Get Gulched!!! Hi Chuck – sorry it took me so long to answer. That was “I’m Ready” by John Hammond. Thanks for listening. appreciate it. you all are doing good. As an I-17 commuter up north, and I can receive your station up to, and just beyond the scenic overlook, and sometimes further. You entertain me on the way up the hill, and de-stress me on the way home, minus annoying ads. I love your programming and hearing tunes I had forgotten about, and some tunes that I’ve never heard before and really enjoy. Keep up the good work, and a big bump in power would make your station sky rocket. Hey Northlander – thanks for writing. Wish we could have more power, but right now we are running the maximum power allowed for our type of no-profit radio station. Currently there is a petition before the Federal Communications Commission in Washington DC to allow stations like ours to more than double our power – we might meet the guidlines that would allow such an increase and if we did, we would take that opportunity. It will be at least a year before we find out if the Commission will authorize the power increases. We’re glad you enjoy the station but wish you could listen longer. By the way on some car radios we are being received as far as Kachina Village. Safe travels! So, I am running errands, driving around town. A song comes on the Gulch. I love it, wish I knew its title and artist, but I have never heard it before, and the DJ does not announce it. I get home, go to Gulchradio.com and see if I can find the song on a playlist. There is no playlist that I can find, anyway. This has happened so many times it has become a source of potential irritation. So instead of getting irritated, I write this note, asking: WTH is your playlist?! Sorry for the irritation – currently we can’t publish our entire playlist we can only show the last three songs played, but if you yell me approx what time you heard a song, describe it and was it a male or female artist I can find it for – most likely. Write to us at: gulchradio@hotmail.com – are you listening locally on FN100.5 or in a car internet connected – if you are internet connected, on most radios the song titles and artists stream constantly – anyway write to me and include your time zone. Friends, Jeromans, countrymen, residents of the Verde Valley, citizens of cyberspace, and everyone who can read these words ~~ I wish all of you a very happy and prosperous new year and many pleasant and exciting hours of audio entertainment here on the fabulous Gulch Radio. May your FM signal be static-free, and your internet stream be uninterrupted throughout the coming year. Aloha! Could you please tell me the artist who is playing “I’m a long way from heaven” and who was playing the song before this one, as well. Thank you so much. 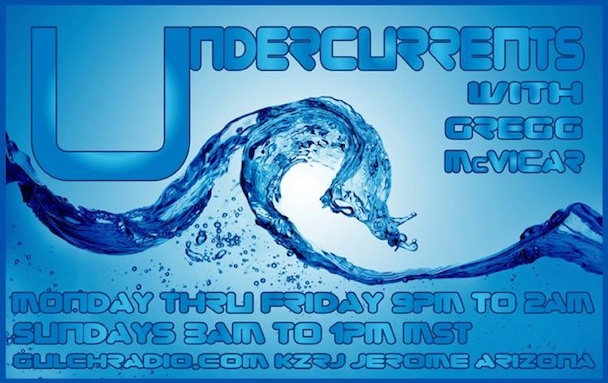 Hi Rob -sorry i didn’t see your message – the songs you referred to were on UnderCurrents, the show number was 3778 that night, so go to their website, undercurrentsradio.net/playlists and search 3778 for the song titles and artists. I’m sorry, the time was just before 3:30 2/12/16. I don’t know how you do it. Your weekday programming is fantastic, each song flowing into the next. Saturday and Sundays we stay home and you’re on all day. And never a commercial. I believe it must be magic and I don’t really want to look behind the curtain. Thank you!! Thanks for the great letter Sunny. We’re glad you enjoy the big variety of music. No commercials ever. Behind the curtain? A couple guys and their friends with big piles of music, a little transmitter and a tall tower. Thanks very much for listening. I “discovered” your station several months ago. Been listening ever since. I’m almost 65 but when I listen to your variety, I feel like I did when FM first broke out in the late 60’s. I don’t know who is behind your station but he/she is an f*&kin” genius! Incredible content, variety and minimal interruptions. Oh and now I discovered that you stream it online as well. How do you do it? Hi Russell – thanks for the letters. We’re some music lovers who got it together and built this thing slowly over the years since 2003.Yes – you can listen wherever you go so take us along. radios programmed with your station on them!!!!! Hey Debbie! Very cool! Thanks for tuning us in on all the cars. Very much appreciated! As soon as I come over Mingus Mountain, I can get your station! Yep! We are there from the summit of Mingus to the slopes of the San Francisco Peaks! Hey Len in Boston – thanks for tuning us in, glad you enjoy the tunes! Just moved to the area. A friend suggested your station. So I tuned in to see. Paul Butterfield and Joe Bonamassa in the same hour. I’m hooked. Keep doing what you do. Mark, welcome to the neighborhood. Thanks for writing, were glad you like the tunes. Nice to hear Carl on the radio tonight. B52s and all. Yep, thumbs up – B52’s and all. Thanks for the nice comment, Isolde. Glad you could tune in. Happy New Year. Moved here from Kansas City in June and found your station. Love all the old songs and blues. The music is refreshing! And you have all the songs we love to listen to. Great set up and enjoy it a lot! Welcome to Arizona Deborah – glad you found us and brought us into your world. Thanks very much for writing. We love the letters. You guys are awesome! Here’s a suggestion for you: add a comedy show for an hour or two each week. The old Firesign Theatre or National Lampoon stuff is still really funny, and there are also a lot of really good current comedians like Lewis Black and Kathleen Madigan who are hilarious. Just a thought. Hi Danny -thanks for writing, we’re glad you’re enjoying the station. We do play the Firesign Theater from time to time, usually on Monday or Tuesday mornings – we also play National Lampoons tuff as well as some Cheech and Chong and also some homegrown stuff. XCheck out Music and Morons on the first Monday of the month. We’ll consider adding more material. My God! a station ran by live humans playing music! Been here since ’87 and this is the first station that I have heard playing Pink Floyd cuts, Leonard Cohen, and all the good stuff. Hi Mike – thanks for writing. Here we are, real humans (though some might question that) doing the radio thing. We’re happy you found us and enjoy the station. Also – thanks for your offers to help. If you want tot alk to us more abut that, better to write to us at: gulchradio@hotmail.com – this website system is a little clunky. I am looking for the Frank Zappa hour on the website but not seeing it. Are you still having it? And I do love your station. The first I’ve ever heard that is completely commercial free. I tell everyone about your station, especially all my buddies back in Indiana listening on gulchradio.com. Thanks for writing Mike – we are glad you enjoy the station but sorry to tell you the Frank Zappa Hour is on break. The creator and producer needed a break to deal with personal issues. When that is sorted out it may be back. Thanks again for listening and spreading the word. Stumbled upon your station on the way by Jerome in May. Loved it for the 45 minutes that we were able to get it. Live in New Hampshie and are thrilled to be able to listen to the broadcasts online. Also love having the playlists readily available. I’ve spent lots of money buying some of the tunes that you play. Great to hear Tab, Taj, Keb and Joe Bonamassa on a regular basis. Better than any station that we have in the northeast! Hi Sue – Thanks for writing. Very glad you enjoy the station. Hope you enjoyed Jerome! Wow, I LOVE this station! Moved to Sedona recently and hate all the other stations! It’s so great not to hear a commercial every 5 minutes and to hear “deep cuts” you haven’t heard in a long time! Hubby asked if I’d like to get Sirius like he has…I said, not if I can have this station. Hi Kathie – sorry I missed your letter. Thanks for writing. It’s our pleasure to provide the tunes and glad to hear from folks who enjoy the music. We won’t be able to add titles and artists to our signal until somebody lays a lot of loot on us – but – you can settle your arguments by checking out our playlists on our home page. The link is at the bottom of the page. My favorite station on the web.Very good job. Thanks for writing and listening. We enjoy letters, especially those from around the world! We’re glad you enjoy the station and thanks for the kind words! My wife and I were visiting Sedona last spring and I tuned into your fantastic radio station. We just had to drive through Jerome on the way back to Phoenix to check it out. Crazy city on top of those cliffs. We really liked it. Now we listen regularly from North Seattle. Thanks for providing such a great station. Looking forward to donating $$. Hi Karl – thanks for the note! We’re glad you listen in Seattle. Jerome truly is a crazy little city hanging on a cliff. Good place for a radio transmitter because the signal can go for miles and miles, basically as far as you can see. We hope you continue to enjoy the station and we cheerfully accept any and all donations, which are used to pay the bills to keep the show on the air. I don’t know what hour it would include but if you could play some Aldo Nova, Pat Travers and maybe some Triumph would be awesome. Good morning Peggy – try your radio dial, we are back on the air, we are still working on it and it will be awhile before everythings the way it should be. Thanks for your years of listening, if you can’t receive us let me know, but Sharon gets us super well so you should too. I have been living in the West Indies for nearly seven months working for an NGO. 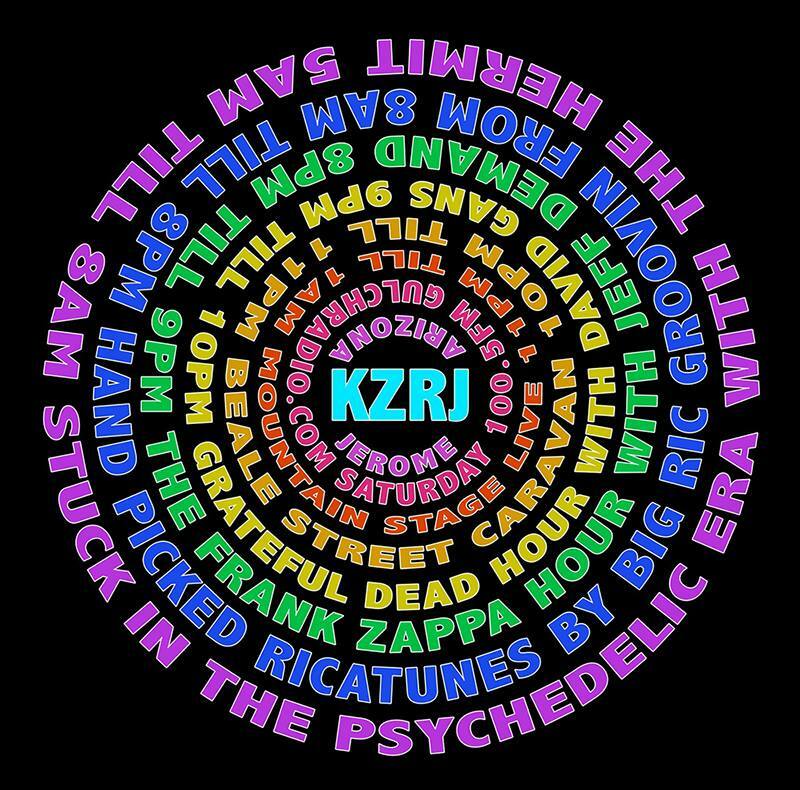 I listen to you via the web and just finished listening to Stuck In the Psychedelic Era. What an awesome way to start my Saturday. I have a piece of my Arizona home in my living room…The Gulch. Thanks guys and keep up the great job where FM means Fine Music. Hi Dean -good morning, Stuck is one of my favorite shows, I’ll send your note to the Hermit, he’ll be pleased. We’re glad to back on the FM again. Hey Dude – thanks for writing, fun to get letters from around the world. Hey good morning mom I adopted you) ! Hope the weather has warmed up for you.